This latest lab requires you to configure a point-to-point GRE tunnel, but with no encryption config. Unless this is your first Config Lab, you know the drill. If not: take 5-10 minutes now, read the lab, and type your answer or write it on paper. Then look for the answer post (which usually follows within a day or two if you happen to read this the day it was posted). 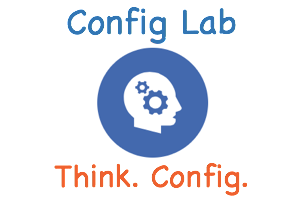 Check here for all ICND2 Config Labs. 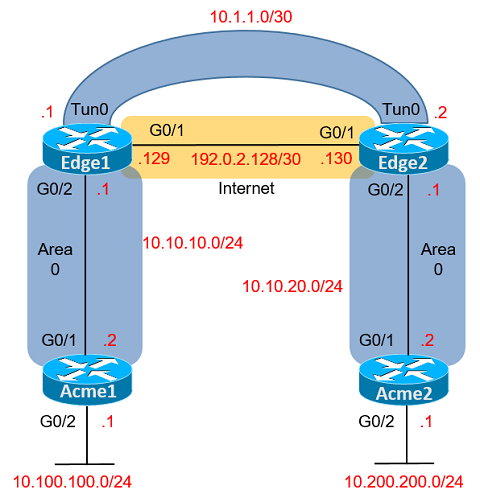 From a GRE tunnel perspective, you will use the public IP addresses on the link between Edge1 and Edge2 as the tunnel source and destination. Then, for the tunnel interface itself, you will place the interfaces into a subnet in private network 10.0.0.0, you will use OSPF to exchange routes from private network 10.0.0.0, with all subnets in area 0. As the tunnel destination, create a local hostname referencing the other Edge router’s Internet-facing IP address (will be interface G0/1 on each router). Then use that hostname as the tunnel destination. Assign the tunnel interfaces private IPv4 addresses from network 10.0.0.0 per the figure. Configure OSPFv2 in area 0 on the tunnel interface using interface configuration (that is, do not use OSPF network commands). Make sure the new OSPF configuration agrees with the existing configuration. Examples 1, 2, 3 and 4 show the beginning configuration state of Edge1, Edge2, Acme1 and Acme2. To test your solution, if you happen to try it with VIRL or real gear, you can verify the configuration and operation of the tunnel interface by issuing the show interfaces tunnel0 command on routers Edge1 and Edge2. If OSPF is configured correctly it should form a neighborship across the tunnel interface. Also, all four of the routers should learn about all the remote subnets in network 10.0.0.0; for instance, on routers Acme1 and Acme2, a show ip route command should list three subnets learned by OSPF once the lab is completed. Additionally, look at show ip interface brief, which should show the tunnel interface, it’s IP address, and a state of up/up. If you do implement this lab, also try a few ping commands. For instance, from router Acme1, the ping 10.200.200.1 source G0/2 command would ping from Acme1’s G0/2 interface address to router Acme2’s G0/2 address (10.200.200.1). That ping would test the routes to subnet 10.100.100.0/24 and back to 10.200.200.0/24.